When I was working in pathology laboratory conducting genetic testing of breast and ovarian cancer patients, I was surprised by the small percentage of patients who carry a BRCA gene mutation, despite evidence suggesting they should have inherited a faulty gene. I set out to search for more faulty genes that could explain why these patients developed breast cancer. In the process, I gained a wealth of knowledge about the DNA repair pathways that are associated with the BRCA genes. A chat with my mentor and current supervisor led to a change in research direction. She had data to show that several DNA repair pathways, including those associated with the BRCA genes, could be involved in chemotherapy resistance in ovarian cancer patients. We decided to combine our expertise, knowledge, and data to find ways to overcome this resistance and improve treatment outcome. An anonymous philanthropic donation to support early-career researchers allowed me to make this leap into a different research field. I was honoured to be a recipient of this fellowship, which meant that I could change my research focus from breast to ovarian cancer, a disease with higher mortality rates and treatment regimens that have remained unchanged in three decades. The funny thing is that I never wanted to perform research on the treatment end of things, thinking that if I made a mistake in my research I might cost someone their life. But I have now realized that if I do the research right, and have checks and balances, I can actually make a difference in the way ovarian cancer is treated, and who knows, might actually allow someone to live a long, cancer-free live! The vision for the research I do is the eradication of ovarian cancer mortality! It is the ‘ultimate goal’ after all. It may not happen in my research lifetime, in which case a more achievable goal will be to provide patients with a treatment option that will have the best outcome for them. It is simply not good enough to tell patients that nothing can be done for their disease if they do not respond to chemotherapy. We must find evidence that existing drugs are not yet being used to treat ovarian cancer can induce a positive response. 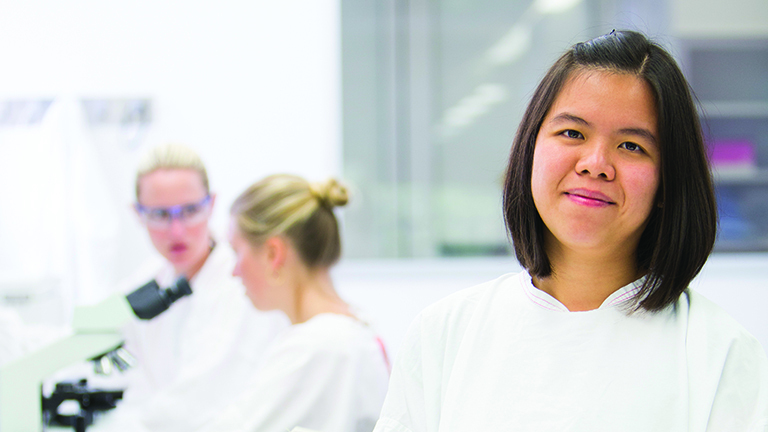 Dr Michelle Wong-Brown is a postdoctoral researcher with the Hunter Cancer Research Alliance (HCRA) Priority Research Centre for Cancer Research, Innovation and Translation, located within HMRI. Her research interest is in the role of the homologous recombination (HR) DNA repair pathway in response to chemotherapy treatment and how existing and new therapies can be targeted towards HR deficiency to improve treatment outcomes for ovarian cancer patients. This aligns with her previous work in the investigation of the genes of the HR pathway and their contribution to breast cancer susceptibility. She completed a Bachelor of Biomedical Science degree in the University of Newcastle and obtained First Class Honours with Faculty Medal in 2008. She was awarded her PhD in Medical Genetics in 2014 from the University of Newcastle. Dr Wong-Brown has published numerous peer-reviewed articles in high-ranking journals in her field of research. She has presented at many prestigious national and international conferences, including the renowned San Antonio Breast Cancer Symposium (SABCS) and European Human Genetics Conference. Her expertise in sequencing led to her appointment as a Member of the Advisory Committee of the Royal College of Pathologists Quality Assurance Program (RCPAQAP) Sanger DNA Sequencing module. Dr Wong-Brown is part of the DNA Repair Group that is working towards using existing chemotherapies to cause just enough damage to the tumour that the patient’s own immune system will recognize the damage and attack the tumour. When used in combination with new immunotherapies, this will hopefully achieve longer and healthier survival times for cancer patients. Investigating combinations of drugs that will provide the best response in ovarian cancer patients depending on their genetic and immunological profiles.